But then, maybe we’d never tried to hike up Mt. Cardigan’s west side on an October weekend, particularly during a fall that’s had more than its share of rainy days. It doesn’t help — that is, when you’re trying to park with a car stuffed with restless children — that Mt. Cardigan, in central New Hampshire, is a famously easy hike with a big reward. The view from Cardigan’s 3,155-foot summit, thanks to a fire that swept over it in 1855, is far more expansive than it has a right to be. The exposed granite and scrubby alpine vegetation is more typical of the much higher alpine zone of the White Mountains. Even better, on our side of the mountain (AMC’s Cardigan Lodge is located on the opposite, eastern, side), a long access road climbs to a parking area just a mile and a half from the summit, creating a hike that’s just right for families with young kids. Oh yes, the parking area. It was beyond full when we arrived on Saturday afternoon, but two cars pulled out moments later. As we set off up the mountain — our two kids and four of their friends, ranging in age from 7 to 13, plus three adults — we met a stream of hikers coming back down. A couple of things stood out on the hike. For one, the wide age range and the presence of friends totally mixed up the usual sibling dynamics. All the way up, the kids moved together as a pack or split into groups, the older ones looking after the younger ones and urging them on, or “competing” in teams, the younger ones hurrying to keep up. For another, no one hurried. We three parents knew that we had more than enough time to reach the summit and get back to the cars before nightfall. No one had homework or a sports practice to get to. We noticed that the higher we hiked, the more the kids seemed to let their imaginations run. They stopped and explored colorful leaves. They found hiding places off the trail to jump out and surprise whoever was coming up. They built dams to re-direct small rivulets — it had been raining a lot. They called one trickle the Nile and named the dirt and gravel that fanned out from it the Nile delta. They created a “no-touching-leaves-on-the-trail” game — and, on top of the wind-blown summit, yelled, “I see Greece!” “I see California!” “I see Rome!” guessing at the directions they faced on the compass as they yelled. 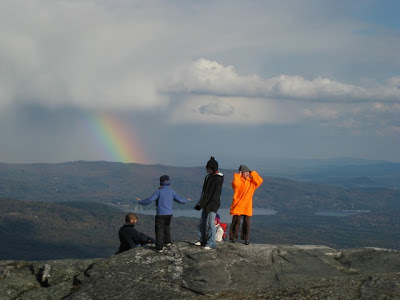 While we were on the summit, a brief, fast-moving rain shower left dramatic dark clouds and open sky and a startling rainbow. We didn’t notice, right away, that all of the day’s crowd had left by then. We had the place to ourselves. ... about AMC's Cardigan Lodge. Fall and winter service runs from October 23 to December 31. ... about other great fall hikes with children.